A common problem in trying to broadly protect one’s invention is the lack of focus on the point of novelty of the invention. Without a clear description of what the invention is in its most basic elements, the patent application will not have a clear focus, the claims will not be broad, and prosecution may stray from the most important aspects of the invention. Inventions are usually designed for a primary use (i.e., initial field of use or vertical market) but may also be used in ways beyond the inventor’s original intention. For example, a pencil may initially be designed for use in an academic setting, but upon further exploration, a modified version of the invention may also be used in a construction setting. This expanded utility increases the potential for an inventor to make money from the sale of that invention and may motivate the inventor to think of other bells and whistles for the invention and further broaden its applicability. Many inventors find this possibility exciting and may expend an inordinate amount of time and energy brainstorming ideas. They are often excited to introduce the new product into the marketplace and want to be sure they have thought through the full range of applications of the invention. However, the excessive exploration of the invention’s possible utilities may cause the inventor to lose sight of the primary utility and prevent the inventor from properly identifying the point of novelty. Sometimes, in these cases, the invention takes on a life of its own. Instead of remaining focused on the point of novelty, the inventor may be distracted by the secondary aspects. These secondary aspects may be interesting, but are nonetheless ancillary and are not crucial to the point of novelty of the invention. Keeping an eye on the point of novelty of the invention is important because, as I discuss below, it helps structure the patent application and dictates the examination and overall strategies for protecting the invention. A part of my job is to keep the inventor focused on the invention’s point of novelty. Otherwise, decisions and key points of the patent process may be based on something other than the point of novelty, complicating the patent process and jeopardizing the scope of protection afforded by the patent. What is the point of novelty? The point of novelty is the invention’s “secret sauce,” the principle operation of the invention, and the glue that binds the entire product together. The point of novelty must be the guiding point of reference when developing the patent claims in the patent application, the examination strategy, and the basic structure of the patent application. If the point of novelty is not identified correctly, the structure of the patent application, the “metes and bounds” (i.e., the focus of the claims that define a patent’s scope of protection) of what is being claimed as the invention, and the progress of the patent examination process may produce less than stellar results. This, in turn, could cost time and money to fix, if a fix is even possible, especially if the application has already been filed. Deficiencies in the patent application caused by an inaccurate identification of the point of novelty may be irreparable and narrow the claims of the patent so as to be meaningless to the inventor. To begin to understand how to identify the point of novelty of the invention, I will walk through the mental steps that I take using an example of a hypothetical mechanical pencil featured on the left side of Figure 1 below. One way to identify the point of novelty is to work backward from a new benefit of an invention not provided by existing products or technology. For example, the problem with writing instruments prior to the invention of mechanical clicker system was the time spent sharpening the pencil. The benefit of a mechanical pencil over a wooden pencil is the elimination of this step for the user. The mechanical pencil always stays sharp because it has a mechanical clicker system (i.e., solution) that extends the proper amount of lead upon each click. In this example, the mechanical clicker system is the point of novelty. In this hypothetical case, a basic wooden pencil, pictured on the right in Figure 1, is considered the “prior art” for the mechanical pencil invention. Prior art is anything that can be used by the USPTO to reject a patent claim or invalidate an issued patent during litigation. Generally, prior art includes current patent applications and granted patents on existing technology that are available to the public prior to the filing date of the patent application. The point of novelty is the “point of departure” (i.e., that which makes the invention different) from the prior art. The claims presented in the patent application and the patent should focus on (i.e., should be directed to) the point of novelty. Otherwise, the claims presented in the patent application and the patent are not fully protecting the invention. During the inventing process, inventors may brainstorm other secondary features to include in the application such as a specialized grip for the fingers or an eraser that can be removed and attached to the top end of the pencil. The inventor may get off track and begin to attribute more importance to the grip or removable eraser, for example, than to the mechanical pencil’s primary point of novelty (i.e., the mechanical clicker system so that the mechanical pencil is ever-sharp). Does the grip enable the mechanical pencil to remain forever sharp? No. Does the removable eraser enable this benefit? No. Does the mechanical clicker system enable this benefit? Yes. It is important to focus on the primary benefit of the invention (i.e., the mechanical pencil remains forever sharp) and work backwards to the part of the structure (i.e., the mechanical clicker system) that achieves that benefit. If more importance is erroneously attributed to the grip or the removable eraser, the inventor may be tempted to focus the claims of the patent application on these ancillary features instead of the mechanical clicker system. If the focus of the claims of the patent application is shifted away from the point of novelty, any patent that matures based on these shifted claims may provide inadequate patent protection. By identifying and focusing on the point of novelty, the structure of the patent application and its claims will more likely provide a focused, meaningful scope of patent protection for the invention because they are directed at protecting the invention’s key feature. Any temptation to shift the claim scope to a feature other than the point of novelty should be resisted. The inventor should stay focused on the point of novelty and draft the patent application to draw attention to the point of novelty. Am I saying that the application should not include other features of the invention or pencil? Absolutely not. 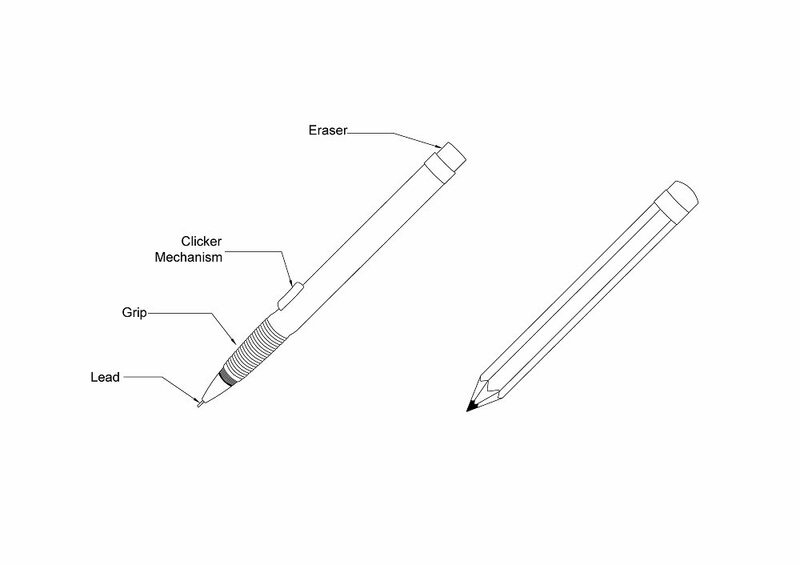 If these secondary features, such as the grip and removable eraser, as in the example of the mechanical pencil, are beneficial to customers, they should be included in the patent application. However, they should be described in such a way that it is obvious they are secondary in importance to the identified point of novelty. Furthermore, refinements to the point of novelty should be included and expanded upon in the patent application. For example, there may be a tongue and groove configuration added onto the mechanical clicker system that helps the mechanical clicker system work better. This configuration should be included in the patent application. Furthermore, the patent application should include its reverse: the groove and tongue configuration. Although describing the reverse situation costs more time and money, it would be a worthwhile investment since the reverse situation may be directly related to the point of novelty. Finally, the point of novelty is also useful for identifying a minimally viable or sub-optimal product that could still be a viable competitive alternative to the proposed invention. Inventors often believe that their invention is the best in a particular metric (e.g., speed, ease-of-use, etc.). Inventors want to, and should, protect this benefit. However, inventors should also think about protecting sub-optimal versions of their inventions or products. The patent application should therefore include information related to the preferred version of the invention along with other versions that may be less optimal, but would still be able to compete in the marketplace. For example, if an inventor conceives of a way to build the fastest car and wants to patent it, and if a corresponding patent protects only the fastest car, competitors could introduce the second-fastest car at a lower cost. These companies would avoid patent infringement liability and still compete for customers who do not want to spend more money on the fastest car, but are willing to spend substantially less for the second fastest. In other words, customers may choose to buy a product that is slightly inferior for a significantly lower price. To prevent such competition, patents should be broad enough to encompass products that are slightly slower or slightly less easy to use, but that nevertheless incorporate the point of novelty. This is done by disclosing and claiming the point of novelty in the patent application broadly enough to encompass the minimally viable product. To fully understand the importance of properly identifying the point of novelty, one should understand the balance we, as patent attorneys, try to achieve for clients. On one hand, patent attorneys try to present a narrow claim that does not encompass the prior art (i.e., information that is in the public domain) or is not an obvious variant of the prior art. If this occurred, the claimed invention would be rejected for being either not novel or an obvious variant of the prior art. On the other hand, the claims must be broad enough so that the scope of patent protection afforded under the patent would adequately prevent others from competing with the inventor. The patent examiner decides whether a claim is so broad that existing technology or information would anticipate (i.e., already includes or discloses) the claimed invention. In other words, the examiner might reject the patent application by alleging that certain prior art references show that the claimed invention is not novel or is an obvious variant of an already existing idea. A simple way to visualize this examination process is to ask whether the claim in the patent application is so broad that existing technology would infringe on it if the claim were to mature into a patent. If so, the maturation of the patent would be unjust because manufacturers of existing products would suddenly be infringing on the claims of the patent. The claims need to be narrow enough so that the issued patent would not encompass preexisting technology. However, the goal of the patent process is to secure meaningfully broad patent protection over the invention such that competitors would find it difficult to copy or make minor modifications while avoiding patent infringement liability. Simply put, patent attorneys do not want to secure claims that are so narrow that competitors may use the invention without liability by designing around the patent. Rather, our goal is to secure claims that are meaningfully broad (not too broad or too narrow) to make it difficult for competitors to design around the patent claims, yet also ensure that the application has the ability to mature into a patent and not be rejected due to prior art. In the above example of the mechanical pencil, if the point of novelty is the mechanical clicker system and a decision must be made to narrow the claims, everyone involved needs to make sure that the claims remain focused on the point of novelty. This means including limitations on the claims that are related only to the point of novelty and not secondary features, which would significantly narrow the scope of the claims. For example, suppose the claim is amended to include a secondary feature, such as the grip on the mechanical pencil. If the competitor then incorporates a different form of the grip while using the same mechanical clicker system, this competitor would avoid patent infringement liability. The patent attorney needs to find the right balance so that the patent claims are not so narrow as to be easy to design around or so broad as to encompass existing technology. If the point of novelty of the invention is improperly identified, this balance may be lost and leave the inventor without meaningful protection. 2 Even though it is crucial to construct the “specification” (i.e., written explanation of how to make and use the invention) around the point of novelty, the focus of the claim should also be on the point of novelty. However, the focus of the claims and the specification on the point of novelty should not be fixed in stone. During examination, there might be a reason to shift the focus of the claims away from the originally identified point of novelty. For example, the examiner may cite (i.e., find and point to) a prior art reference that includes or discloses the identified point of novelty for which the inventor is seeking patent protection. There may be prior art that includes the mechanical clicker system mentioned above. If this is the case, then the claims of the new patent application should be focused on a more refined aspect of mechanical clicker system or on a secondary feature (e.g., grip or removable eraser). For more about the intricacies of how claims are constructed, please see Chapter 11.